The Mexican Habanero Chilli is the hottest variety of chilli from Mexico. They are an integral component in Yucatecan Mexican cuisine. With their fruity & floral aroma, it is a popular choice for adding a spicy citrus-y kick to any dish. 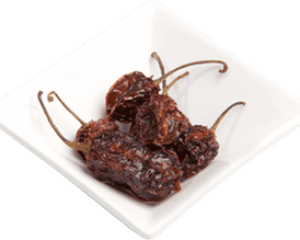 Dried Habanero Chilli is the perfect addition to any Mexican dish. The Mexican Habanero Chilli is the hottest variety of chilli from Mexico. They are an integral component in Yucatecan Mexican cuisine. With their fruity & floral aroma, it is a popular choice for adding a spicy citrus-y kick to any dish. Dried Habanero Chilli is the perfect addition to any Mexican dish. For optimum results and flavour, re-hydrate the chilli in boiling water for 20 minutes before use. Chilli Habanero Whole adds great heat and flavor to all types of Mexican salsas, from tomato to pineapple. Use the chillies to flavour salsas, sauces, and any dish that can use a bit more of a spicy kick. The best flavour is acquired by re-hydrating the Chilli in boiling water for 20 minutes. For the perfect Mexican sauce, remove the seeds of the Habanero Chilli and combine with capsicum, boil together and blend to get a great spicy smooth sauce. Mexican Habanero Chilli, as well as all other chillies, contain capsaicin, which is the compound that provides several health benefits and are a good source of vitamins, minerals and dietary fibre.